David, I could kiss you for mentioning the K-for-Passover powdered sugar. I hadn’t known it existed. This cake is perfect for Passover because anyone would love it at any time. Thank you thank you!!! Ellen, you are more thna welcome! Jennie, many thanks for touching base and especially for the vanilla bean trick, I’ve added that to the recipe. We did not test it with olive oil but you’re right, it does seem a likely match. Kindly let us know how it goes! I need to see what size my smallest cake pan is; if it’s 6 inches, I will try this right away; if not, I’ll get a 6-inch pan, which sounds like an excellent size for a cake! 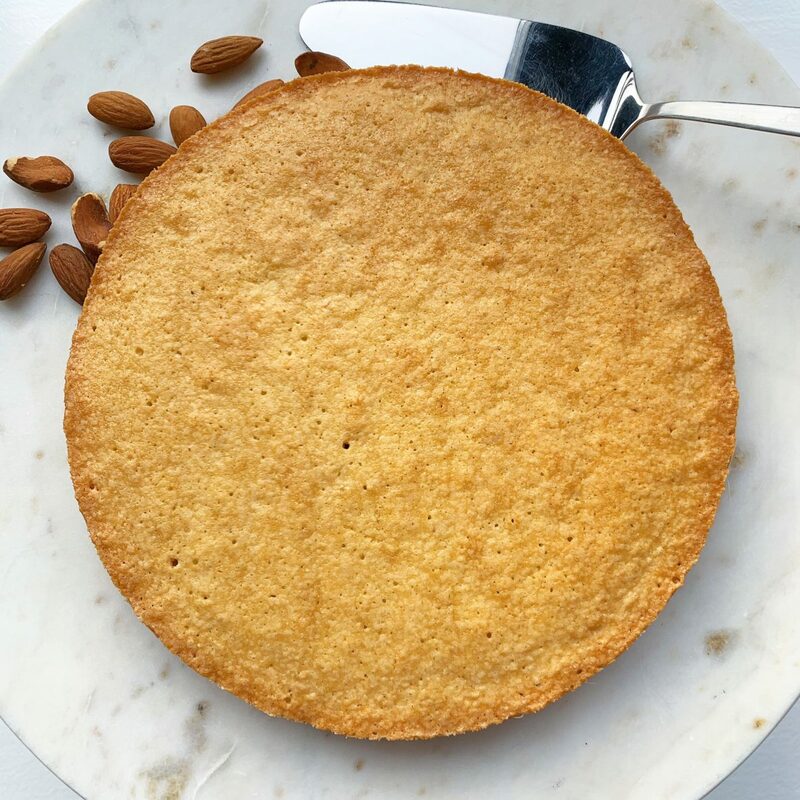 I make an almond cake from Alice Medrich that has 1 1/2 ounces of flour and 1/4 teaspoon baking powder so I am interested to see what how different this cake will be with none! Mine also has almond extract and a little Amaretto, no vanilla, so it will most likely be a good addition to my arsenal of the kind of cakes I like—no icing with enough flavor to stand on its own (except for some Jeni’s Sweet Cream Ice Cream, of course)! Oh, Victoria, you said the magic words—Jeni’s Sweet Cream Ice Cream! I am a fool for that. I also think you’ll really like the presentation of a 6-inch cake. You can also make layer cakes that are stacked 6-inch cakes and they tend to look truly spectacularly due to the towering effect. That size is also, natch, much more practical for those of us with smaller households. Do let us know how it goes, please and thanks! What I consider my neat trick for Jeni’s Sweet Cream Ice Cream is I substitute 3 tablespoons of Lyle’s Golden Syrup for the ¼ cup (4 tablespoons) of light corn syrup. It gives the ice cream a very slight caramel-ly taste. I really love it and hope you will try it sometime. I finally made this cake yesterday. I blitzed whole unblanched untoasted almonds in the food processor to make my own flour and did not sift it. I used India Tree Icing Sugar (confectioners), which I sifted through a strainer because I find confectioners’ sugar tends to clump, and India Tree Castor Sugar, and followed the rest of the instructions explicitly. After baking for exactly 35 minutes, I removed the cake from the oven, immediately ran an offset spatula around the edge and removed it from the cake pan. It was PERFECT! I have already added this to my repertoire. It is different and very special, more like a macaroon than a cake. Perfect for four – maybe even six people if topped with ice cream or Crême Chantilly with a little Luxardo Amaretto added. Next time I will stick with the India Tree Icing Sugar but try organic sugar instead of the castor sugar. The larger beige crystals might add a nice touch. You’re welcome, Robin. Love to hear that you found this to be as irresistible as we did! Yeah, I’m not a huge baker but I did attend culinary school and have been around the block once or twice (usually to try and vindicate myself of the extra serving of cake) and I had NO IDEA that confectioners sugar contained anything but, well, sugar! I am such a lapsed Jew that I really couldn’t care less about keeping Passover, but thanks for teaching me something new. I feel a little silly to be honest. About the sugar, not Passover. I wanted to make this cake without butter so I made it with avocado oil instead of butter. I doubled the quantities as I wanted a bigger cake. I don’t understand how you would have gotten a very big cake with the original quantities as stated above, as the one I made with doubled quantities wasn’t very big either. I put almond extract in addition to the vanilla, which was also good. I would call it more of a dense brownie kind of texture than a cake. It is quite sticky – did anyone else think so? I put parchment paper in the tin and won’t be doing that again because it was a pain to get off the cake without breaking the cake. I love cakes made with almond meal but I’m not quite sure about this one as yet. It is not bad but I am going to reserve judgment until I make it with the original quantities and butter instead of oil. I will report back. Sagar, with all the substitutions you made, it’s hard to make a judgment call. Avocado oil and butter are not interchangeable in baking. Also, I never, ever suggest doubling a baking recipe. It often doesn’t work out. Instead I suggest making two of the recipe. Last, the recipe makes a 6-inch cake, which is specified in the servings section. Okay, so here goes David. I made the cake to the recipe without any substitutions. I am happy to report that I had frozen my first version and was able to do a side by side taste comparison. What do you know – the difference was – wait for it………………….. negligible. Three of us tasted the two versions under highly clinical conditions i.e. we love cake and dived in – and eh voila – we could barely discern a difference. So, going forward, I will make it with avocado oil because it does the trick and is healthier and I like staying away from butter in baking – I like the challenge. So there:). The good news is that the cake freezes beautifully and tastes better the next day and even when frozen. it does make a small cake however – more like a large biscuit:). I admire your persistence and careful examination. So, may the baking gods go with you as you make your version. It sounds lovely! I would love to make it but without eggs. What should I use? Urmila, we didn’t test it without eggs, and so I’m hesitant to offer any suggestions because we only post recipes that we have tested over and over with great success. Eggs are a critical binder in this recipe since it doesn’t contain gluten. I’m sorry I can’t be of more help. My mom cannot have gluten or cane sugar/confectioners sugar. Can you suggest a substitute? I’d really like to make this cake for her. Jean, I so admire your desire to make this cake for your mom! However, we didn’t test the recipe with any sweetener other than sugar and I worry that using a different sweetener will not only affect the flavor profile but the texture of the cake. I, too, am on a limited diet, and I have had the most success when I make recipes that are designed without those ingredients that I can’t have rather than when I try to tweak and make substitutions in other recipes. Baking is such a precise science and this recipe has so few ingredients I really worry what changing one of them would do. I would love to help but I don’t want you or your mom to be disappointed. Also look for beet sugar. It is interchangeable in recipes with cane sugar. My brother is allergic to cane sugar as well. We used to use Walmart brand sugar since it stated it was beet sugar. They have changed it to sugar and I am forced to go to health food stores to buy beet sugar. I never noticed a difference in taste before (I am very picky). As I said Walmart sold it as their store brand sugar. Good luck. Thank you, Tmama! Excellent advice! This cake was so, so good! It was moist on the inside and wonderfully chewy on the outside, exactly what I was looking for. I was baking it for a friend and wanted to try a sample of it first, so I made it in two 4″ tart pans instead of the single 6″ cake pan. I decreased the bake time to about 30 minutes and it worked great. The recipe reminded me a lot of financiers, so I took inspiration from those and browned the butter. I used vanilla but might try some Meyer lemon zest or the suggested orange flower water next time. And trust me, there will be a next time! Grace, that is magnificent to hear! All of it! Many kind thanks for taking the time to let us know how well it worked. And I love your spirit of innovation. Simply love it. Looking forward to hearing about those variations and about what you think of the next recipe you try on our site! just made this cake. Ok I didn’t have a 6 inch pan, but a 20cm so almost 8 inches. it came out a bit thin, so i was discouraged, until….. i tasted it, it’s delicious!! then suddenly the thinness didn’t matter, love it! Wonderful, Sheyla! And we understand that a 6-inch pan is sorta uncommon, and we had intended to try to tweak the recipe to work in a larger size pan, but the cake’s taste and texture are so wonderful we didn’t want to mess with it at all! LOOOOOOOVE! I’m largely gluten-free for the same reason, PJ, and it’s remarkable how many lovely recipes just happen to be gluten-free, as I’m sure you’re finding. Personally, I tend to prefer those recipes that don’t require jumping through a lot of hoops or other obstacles, but that’s just me. Happy baking and noshing! I have now made this recipe dozens of times and have found that if I double all the ingredients (except the salt, which I keep the same), it works well in an 8-inch cake pan. When I increase the size of the pan from 6 to 8 inches, I find that in my oven 40 minutes is the amount of time I cook it; 35 in the 6-inch pan. Thank you so much, Victoria, we so appreciate your insight. And the fact that you perfected the recipe! Favorite cake recipe to do. Especially for emergencies. I and most of of my family are gluten free and it’s great to have a cake that is gluten free and yet still, in one of my cousin’s words, tastes like real food. I usually double the recipe and cook for 1hr. Two double batches if i am making a two layer cake. It goes well with a varied type of different flavor icings. Appreciate the clarification, Maria, thank you! Grateful for this information. Not sure what I did wrong but my top and bottom got crispy but the inside didn’t cook. Maybe I blended my batter too much? I used a six inch square dish maybe it was too thick to bake it in? Hi Sharon, it sounds like your oven temperature might be a little off. Have you tried calibrating your oven with an oven thermometer? Did you use a cake tester to test doneness? I’ve made this twice. The first time as written, and the second time I doubled it, added a quarter cup of cocoa powder, and baked it in an 8″ pan. Delicious! Like the fudgy, chewy brownies I’ve missed since going gluten-free. I am almost crying with joy over this cake! Not only is it really fast to put together, it came out beautifully despite me forgetting to sift the almond flour, and stirring in the vanilla while the batter was in the pan, due to a case of Absent-minded Augh. I haven’t done much baking since being diagnosed with non-celiac gluten intolerance and also because I have non-standard working hours where I end up coming home close to midnight and I have housemates who wouldn’t really be at all pleased if I started clanking around in the apartment at 1am. This comes together quick enough that I can throw it together on the weekends or a half-day off. I didn’t have a 6″ pan, so I used the nearest thing I had – a 7″ pan, and while it’s a more like a rather chonky flat biscuit (cookie) instead, it tastes so. so. good. I’ve been sneaking chips off it while waiting for it to cool. This is a keeper. Cake! I don’t usually eat cake but this is a treat that I have really missed since going gluten-free. Shuku, I’m delighted you found a recipe that works for you. Being gluten-free doesn’t mean you have to be cake-free! David, exactly!!! I don’t often eat cake as it is, even when I still could – but this is so good I could go through a whole one myself! Guess what I’m making again tonight after an absolute crappy week :) Thank you so much for this recipe. It makes me smile like a Cheshire cat on sugar and crack highs! And I hope you enjoy it with every bite of that Cheshire Cat smile, Shuku. It is now 3/4 gone and I absolutely REFUSE to feel guilty for scarfing down all of that on my own. If the Cheshire Cat was in a Biggest Grin competition with me right now, it’d lose FLAT OUT. I’m still grinning (and purring) and it is only by a sheer act of willpower that there is any more cake left for tomorrow. BLISS. Purr away, mon chat, purr away! 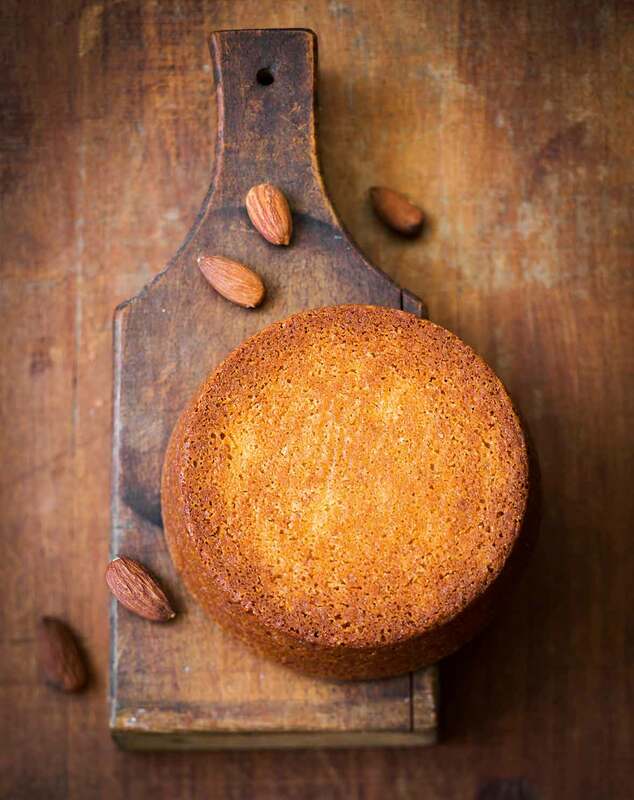 This almond cake is like a big, delicious macaron. 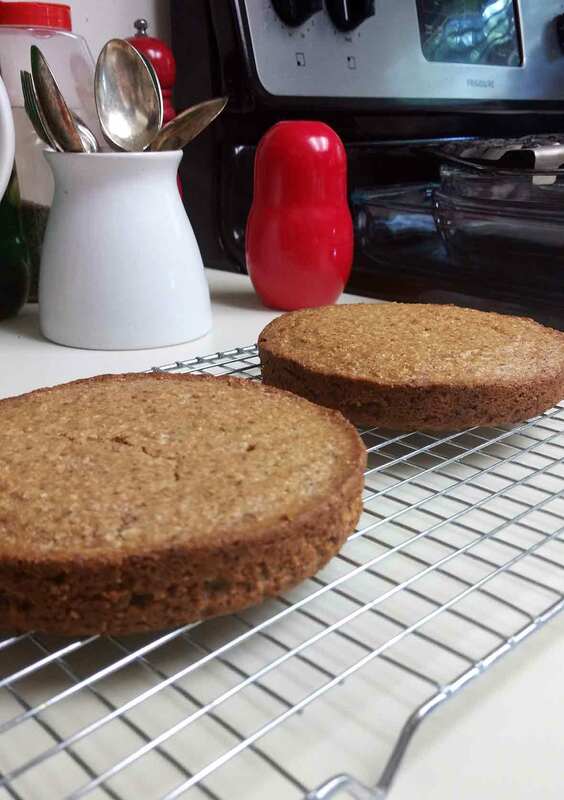 The only issue I had was that my cake didn’t rise much—my finished result was much thinner than in the picture above. I have extra almond flour so I’ll be trying the recipe with metric measurements this weekend! Side note: Though I’m sure coffee complements this cake well, we were noshing in the evening and so opted for glass of Madeira instead. This was a perfect pairing. I mean, who needs coffee when you have wine?! Love that you fell for this cake, Kristen! Ours, too, were on the thin side as it’s a moist and dense cake. Let us know how it goes with the metric measurements! And why choose?! Let there be coffee AND wine! I’m very excited to make this recipe but was curious if I could replace the honey with Swerve for a sweeter flavor? If so, would you recommend granular or powdered? Thank you! Roxanne, there is no honey in the recipe. That being said, we haven’t tested this recipe with sugar substitutes. If you try it, follow the manufacturer’s substitution recommendations for the best results. Made this little cake recipe after work to take with me tonight to our homegroup. The recipe is super quick and easy. Not quite the texture I expected, I should’ve sifted the almond flour more but the little piece of cake I tried (that fell off the side) tasted good! I use coconut sugar instead of white sugar. I plan to serve it with some squirty whipped cream and a blueberry compote I made. Lovely, Amy! And I am sorta enthralled with using coconut sugar here, I think that lends just the right note to the other ingredients, many kind thanks for sharing that inspiration! And that gorgeous shot! Can this be made into cookies or cookie bars? Cindy, I don’t know, as we never made it that way. There would be so many adjustments that it would be something entirely different. I think you’d be better served by trying these flourless almond cookies. 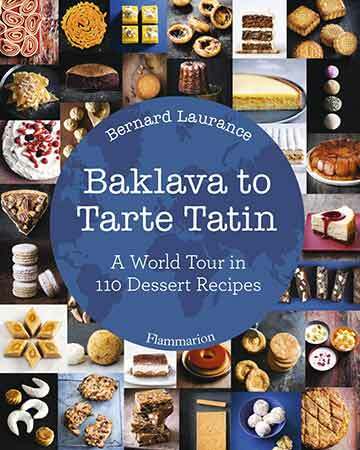 I am not much of a baker and would love to try this recipe. I gave an 8” springform pan and would like to use this. Can you please adjust the quantities in this recipe to accommodate an 8” pan so when using this size the cake doesn’t come out looking like a cookie. I doubled the recipe and put it in a 9″ cake pan. But it should fit an 8″ pan since it only filled my 9″ at most 3/4 of the way full. You have to bake it a bit longer. This was so good, I made it two nights in a row. Like a big chewy macaron…with the perfect crispy edge. The family is demanding that I put this into the Passover dessert rotation every year. I don’t have the heart to tell them how easy it was!! Releases from the pan with zero difficulty. For those who could not find a 6-inch pan, neither could I. I used an 8-inch round and one night I made 1 1/2 times the recipe and the second night I made 2 times the recipe. Both turned out great! Janet, first of all, your photo is beyond stunning! And your advice is helpful beyond words. Thank you! We’re asking our recipe testers to replicate your tweaks so we can ascertain baking times and share that advice with readers. Also thrilled to hear that your family is as in awe of this cake as we are! We so appreciate you. Happy Passover…!